After dual SIM smartphones, it’s time to go dual screen. In India, dual SIM smartphones are very popular, but now here comes a new concept. A dual screen smartphone called YotaPhone is set to launch in India via Flipkart. This smartphone was originally unveiled last year at CES, and the company revealed the next generation of YotaPhone at MWC. According to the company the new YotaPhone (2014) is more ‘intuitive and interactive’, with new hardware and software features. The biggest features of the device isnthe full-touch control for its always-on E-ink display. 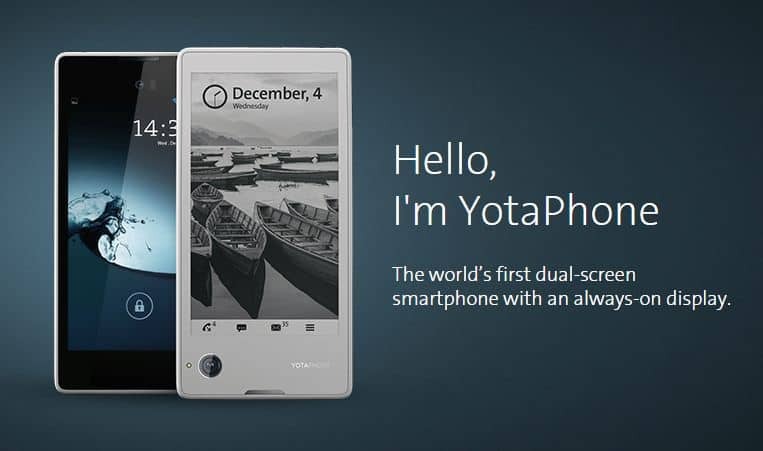 The new YotaPhone will launch Europe in late 2014, and thereafter in 2015 make its way globally. But, at present there is no words about the pricing of this gadget. The YotaPhone (2014) is powered by a quad-core Snapdragon 800 processor and features a 4.7-inch E-ink display. The smartphone is Android-based, and as for version, Yota Devices had only mentioned ‘latest’ version at the time of launch so may be we can expect Android 4.4 Kitkat right out of the box (though the official websites entions Android 4.2 Jellybean). The front display, a 5-inch AMOLED offering, bears a resolution of 1080×1920 pixels, with a pixel density of 442ppi. The next-generation YotaPhone is powered by a 2.3GHz quad-core Snapdragon 800 MSM8974 processor with an Adreno 330 GPU, coupled with 2GB of RAM. It includes 32GB of built-in storage, though there is no words about the availability of expandable storage. It sports an 8-megapixel rear camera with LED flash alongside a 2-megapixel front-facing camera. The handset measures 8.9mm thin and weighs 140 grams. It supports nano-SIM, 2550mAh battery and comes with 4G LTE, Wi-Fi 802.11 a/b/g/n/ac, USB 3.0, Bluetooth v4.0, GPS/ A-GPS and Glonass, and NFC connectivity options. You can check the full specifications below.